Finally, I will start posting once again after a long time. So, thought of starting with some sweet dishes which I prepared during this puja. 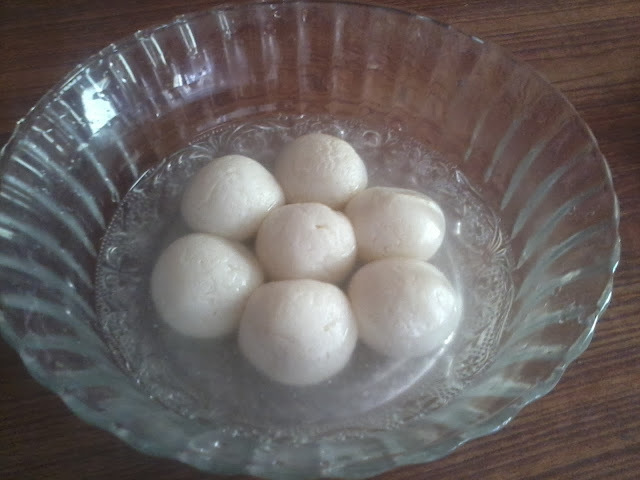 No celebration is complete without the rasogolla/rasgulla specially for Bengalees. This awesome sweet dish captures everyone's heart, the moment it is tasted. It is relished almost everywhere in India and abroad. So, just have fun and try out this easy and famous sweet! Take the milk in a pan and bring it to a boil. Once it starts boiling, remove from heat.Stir for 5-7 mins till it turns slightly cool. Now add the diluted vinegar solution and stir the milk gently.The milk will curdle and the whey would seperate from the milk. Strain the curdled milk with a cheese cloth. Homemade chena /paneer is now ready. Transfer the chena to a clean flat plate and add maida to it. Knead and mix well to make it smooth and free of lumps. Then make lemon/ping pong size balls. There should be no cracks in the balls. I made around 12 balls. Add the water and sugar in a pressure cooker and bring it to a boil. Add the prepared paneer balls and close the cooker. Cook for 1 whistle and then cook on medium for 7-8 mins. Cool and open the lid, the balls would just double in size. Remove from the cooker and transfer them to a bowl. Wait for at least 2-3 hours before serving so that the rasgullas get time to soak in all the sweetness. So just enjoy these easy to make Bengali Sweet- Rosogolla! 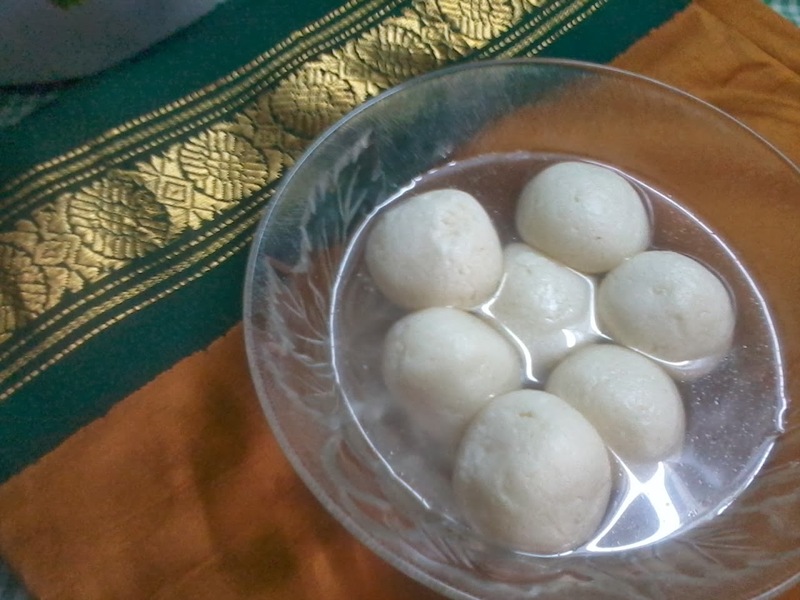 Simple delicious and easy rasgulla recipe.